Thanksgiving is a time of celebration for families. It’s when we all get together to give thanks for blessings received. Take your children for a nature walk to collect pine cones. While they can also be purchased in craft stores, it’s more fun to go out and find them yourself. Place pinecones in a brown paper bag and microwave for one minute. This kills any insects or larvae that are living in the pine cones. 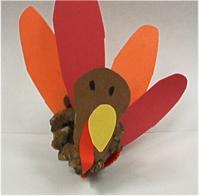 TIP: Each child can decorate their place at the Thanksgiving table with their own pinecone turkey. If guests are bringing their children, make a pinecone turkey for each child. Thanksgiving is a historical holiday. 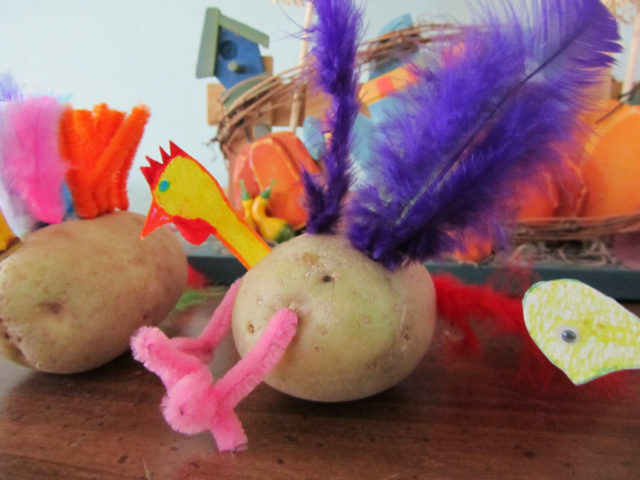 As we all know, the pilgrims celebrated the first Thanksgiving to give thanks for a bountiful harvest. It’s great to share this history with kids and teach them to be thankful. 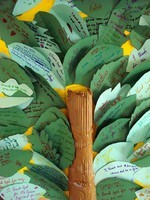 With this project, you can help little ones create a Thanksgiving tree poster to show others what they are thankful for. This is a tradition in our family that has been a hit since I was young. When I was in elementary school, the teacher taught our class how to make Autumn leaf placemats. Back then, they were made with wax paper. Today, there are easier ways to make leaf placemats. When my daughter was young, I taught her how to make an Autumn leaf placemat and then a few years ago, I did this with my grandsons. They still have their Autumn leaf placemats and use them each year for Thanksgiving dinner. TIP: Instead of using contact paper, you could take your child’s Autumn leaf chalk drawing and have it laminated.